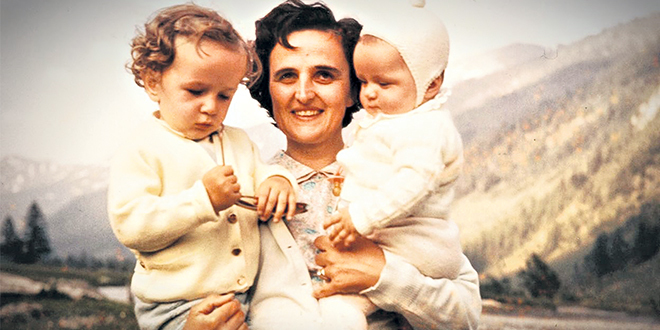 Saintly guide: St Gianna Beretta Molla with her children. OF the ways in which Jesus defined his mission, the one that sums them all up is: “I came that they may have life, and have it abundantly” (Jn 10:10). Read in the light of his post-resurrection commissioning of his disciples – “As the Father has sent me, so I send you” (Jn 20:21) –these words also define the mission of every baptised Christian. Authentic Christians are they who, in Jesus’ name, promote, defend, nurture and enhance life. In extreme situations, they may, like the Good Shepherd, even be prepared to lay down their own lives in doing so (Jn 10:11). Many examples of such sacrifice come to mind. I think of people like St Maximillian Kolbe (1941), the seven Cistercian martyrs of Algeria (1996) and the subject of this brief essay – Dr Gianna Beretta Molla. An outline of Gianna’s life can be simply told. The tenth of the thirteen children of Alberto Beretta and Maria de Micheli, she was born in Magenta, Northern Italy, on 4 October 1922. She studied medicine in Milan and Pavia and, despite the chronic ill health which put paid to her ambition of serving as a missionary in Brazil, received a medical diploma in 1949 and higher degrees later. In 1950 she established a practice in Mesero, specialising in paediatrics. Gianna married Pietro Molla, an engineer, on September 24, 1955 in the Basilica di San Martino in Magenta. They became the parents of Pierluigi (1956), Mariolina (1957–1964) and Laura (1959). A crisis arose during the second month of Gianna’s fourth pregnancy when a benign fibroid tumour developed on her uterus. After consultation, the doctors gave her three options – an abortion, a complete hysterectomy or the removal of the fibroma. Needless to say, she rejected the first option; and, though she might have invoked the principle of double effect, she decided against the second. A hysterectomy would have resulted in the death (not willed but permitted) of the foetus. Intent on saving her unborn child’s life at any cost, she opted for the removal of the fibroma. A daughter, Gianna Emanuela, was delivered by caesarean section on Holy Saturday, April 21, 1962. Sadly, a week later, after enduring severe pain, Dr Gianna Beretta Molla, aged 39, died from septic peritonitis. Cardinal Giovanni Colombo, the Archbishop of Milan, supported by sixteen other bishops, petitioned Pope Paul VI to initiate her cause for canonisation. The details of the various stages of this process, conducted by the Congregation for the Causes of Saints, and of the required miracles attributed to her intercession (one involving a 27-year-old Protestant woman, Lucia Sylvia Cirilo, in Brazil) may be sourced elsewhere. Gianna Beretta Molla was beatified on April 24, 1994 in the Year of the Family and canonised a decade later in St Peter’s Square on May 16, 2004 by Pope John Paul II. Her feast day is commemorated on April 28, the date of her death. What an extraordinary experience this canonisation must have been for her husband and her three surviving children who were present on that day. It was the first time that a husband had ever witnessed the canonisation of his wife. For the record, Pietro Molla, surrounded by his children, died on Holy Saturday morning on April 3, 2010 at the age of 97. Gianna Emanuela Molla became a medical doctor like her mother and practised as a geriatrician. Br Brian Grenier is a Christian Brother in Brisbane.